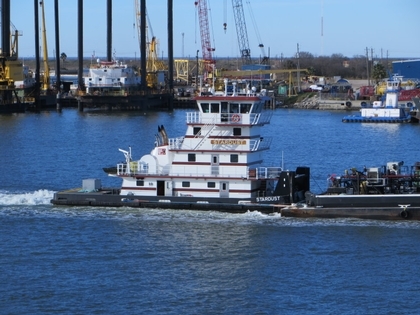 Built in 2013, by Conrad Shipyard Incorporated of Morgan City, Louisiana (hull #1010) as the Stardust for Harley Marine Services Incorporated of Seattle, Washington. Named for actor George “Randolph” Scott's horse Stardust. Who starred alongside Scott in the film "The Heritage of the Desert." Powered by two, Tier II compliant, Cummins K38M diesel engines. With Twin Disc MGX5321 reduction gears, at a ratio of 5.96:1. Turning two, 72(in) four bladed, fixed pitch, stainless steel propellers. For a rated 2,000 horsepower. Her electrical service is provided by two, 85kW Cummins 6BTA5.9-DM generator sets. The tug's capacities are 30,000 gallons of fuel, 6,000 gallons of water, and 200 gallons of lube oil. The towing gear consists of two, Nabrico 20-HE, hydro electric winches, mounted on her bow.